“In Frank, life really reflects art. In Frank, life really reflects art. Born and bred in Bangkok, Frank has always been a colorful type of guy. 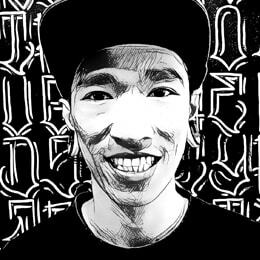 When he’s not at the studio smiling, laughing or creating beautiful artwork, he can be found at psychedelic raves or skating around town (no mean feat on Bangkok streets!). Everyone loves it when Frank is around. He has a positive attitude to life and it shows in his artwork. He really excels in color work, and has a real skill in creating depth and tone in his work. If you need a cover up, Frank is a great choice. Cover ups can be difficult and being able to have the patience and vision to take what you have and create something truly amazing out of it takes a certain type of artist and temperament. So whether you’re looking for a bold colourful piece, or want to breathe new life into, or cover up, an old tattoo: Frank’s got your back.